There have been numerous reactions to many of the policy items in Governor Andrew Cuomo’s state budget. But how did the governor’s budgeting skills measure up? Two budget watchdog organizations are giving him mixed reviews. Citizens Budget Commission has been analyzing New York State and City budgets since the Great Depression. Its President, Andrew Rein, gives Cuomo and his budget office high marks for not overestimating how much revenue the state might receive from authorizing the sale of recreational cannabis for adults in New York, and for not anticipating any tax money from sales until the following fiscal year. Cuomo, in his budget, estimates that when the program is fully up and running, it will generate $300 million dollars a year from three separate taxes on wholesalers, distributors, and retailers. Rein says the governor deserves credit for pushing a congestion pricing plan for Manhattan that will help fund needed fixes to mass transportation, and for agreeing to some reform in the procurement of economic development contracts, which has led to a scandal in the past. But he says there are concerns. The state faces a $3 billion dollar budget gap. Personal income tax revenues were down by $500 million dollars in the last quarter of 2018. Rein says the state isn’t saving enough money to prepare for a potential economic downturn. EJ McMahon, with the conservative-leaning fiscal watchdog group The Empire Center, calls the drop in income tax revenue a “yellow flag”. Cuomo, in his budget address January 14th, blamed the income tax drop on changes to the federal tax code. But McMahon says the governor’s own budget office’s analysis says there’ s more going on, and he says it “cites volatility in financial markets” as a reason for the decrease. He says that lowers capital gains tax collections. A spokesman for the governor's budget office says there's actually more money set aside than what's in the state’s "rainy day" fund. Morris Peters says there is still $4 billion dollars held in reserve from financial settlements with banks after the last recession. He says the total amount currently held by the state in reserve is closer to $7 billion dollars. He also says the governor's efforts in his eight years in office to hold down spending growth and end programs that automatically increased spending year to year makes New York better prepared to weather any potential economic downturn. The governor, in his budget, proposed extending the temporary income tax surcharge on millionaires for another five years. Both Citizens Budget Commission and the Empire Center say that’s a bad idea. McMahon says the state’s wealthiest are already under pressure, and more taxes could cause them to leave the state altogether. 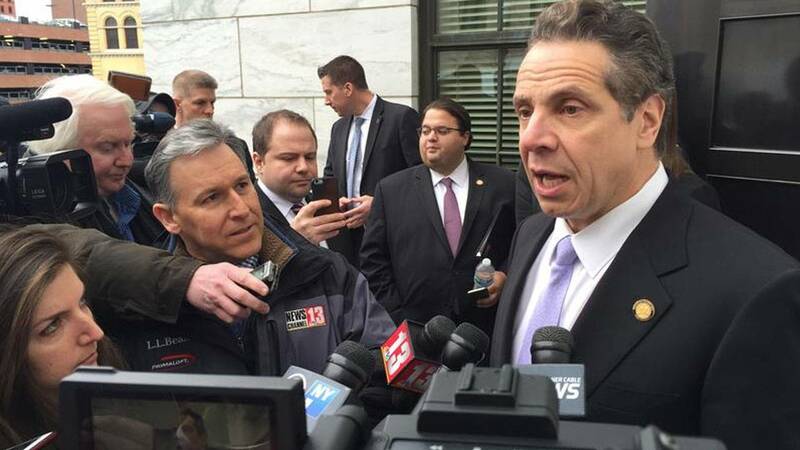 McMahon credits Cuomo for pushing to make the state’s property tax cap permanent. And he says the governor is holding the line on spending growth once again. Cuomo says he’s keeping the spending growth rate to 2 percent, but McMahon says the rate is actually closer to 3 percent. And McMahon says the governor is on the right track by ending a program supported by Republicans in the State Senate that mailed property tax rebate checks to voters each fall, close to Election Day. He calls that program a “complete waste of money”. Democrats who now control both houses of the legislature are not expected to renew it.